In 1941, polio struck Winfred King, a young, hardworking Ohio farmer. The disease put him in a wheelchair for the rest of his life. Over the years, friends and neighbors helped his young family. To express their gratitude, Winfred and his wife, Marie, began giving gifts of homemade candies. What began as a loving gesture in a country kitchen eventually grew into a successful venture that began providing a living for this industrious couple. Marie's Candies opened its doors in 1956, and its reputation for old-fashioned, high quality candies spread across the countryside. The kitchen and retail candy shop quickly outgrew the walls of the small house. In 1966, Marie and Winfred built a combination house and candy shop in West Liberty. Their second son, Jay worked in the candy business with his two brothers during his teenage years. After the death of his father, Jay continued to work in the business taking ownership in 1977. Marie's Candies current location, the Depot, was built in 1926 by the train tracks in the southwest corner of the village. According to local history, some of the lumber used for this project was obtained from the original, early 1900 train depot, built by the Big 4 Railroad and partially destroyed by a fire. In 1930, New York Central Railroad took over this busy, bustling train depot and the day-to-day operation of freight and passengers which continued into the 1940's. The last passenger, Bill King was given a ticket into the West Liberty Depot on his way home from World War II in 1942. Freight continued to be received and delivered until 1960. King Feed and Supply used the gradually deteriorating building for grain storage during the next 30 years. Twice in the late 80's, there were suggestions to save and preserve this local bit of history. One idea from the town of West Liberty was to use the depot as a library. Another suggestion was to move the building out to the Lions Ball Park. Neither of these plans came to pass. A dream to move, preserve, and renovate the building for a retail candy shop had begun to develop in the minds of Jay and Kathy. Their dream became reality in 1992 when they became the proud owners of the depot building. Arrangements were made to pull the building across town about 3 miles. The move occurred in July of 1993. Scores of people lined the streets that day to watch the process and record it with their cameras. Local merchants reported that all the film in town was purchased that day. During the next three years, Jay and Kathy concentrated on restoring the exterior of the building. With help and advice from Steve Gray, a San Francisco architect (who has West Liberty roots), paint colors were decided, an addition was added to the back of the building to house public restrooms, and wooden gutters were replaced. The inside of the depot was completely gutted with the help of a local contractor. Jay and Kathy had concern that the depot retain as much of its original design as possible while adapting itself to a retail shop. Here again, they relied heavily on the advice of Steve Gray, the architect, and the skills of Jeff Heiberger, another local contractor. 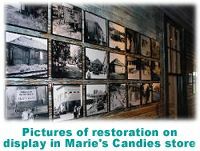 With great excitement, Marie's Candies relocated and opened the doors of the restored train depot on Thanksgiving weekend, 1996, just in time to celebrate 40 years in retail business. The restored train depot stands proudly at the north edge of West Liberty, greeting people as they drive into town. A third generation is now in place. Two of Jay and Kathy's three children, son Shannon and daughter Rebecca, have joined the family business. The family business continues to thrive because of the use of high quality ingredients and special customer attention. 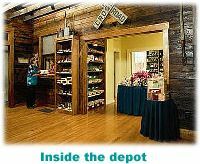 Thus, this historical train depot has become a cozy, quaint chocolate shop. Walk through our doors and be greeted by well trained staff offering a chocolate sample and plenty of chocolates to take home for you and your loved ones.